The Super Mario RPG Original Sound Version is the official compact disc soundtrack to the Square Enix-developed RPG game, Super Mario RPG: Legend of the Seven Stars, featuring tracks originally arranged for the game by Yoko Shimomura. It was released as a Japan-exclusive product on March 8, 1996. 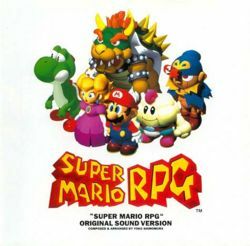 All of the songs are based on the game Super Mario RPG: Legend of the Seven Stars. Ironically, the song "Slope" (Booster Hill) ends a few seconds earlier in the soundtrack album than in the game in the D Major verse. However, the original full version of the song has its last two verses in E Major and a repeated G♭ Major in a higher octave than the first verse, both verses of which were absent in the soundtrack album and in the game. "Fight against Koopa", the track played during the battle against Bowser at the beginning of the game, is a version of Super Mario Bros. 3's final boss theme, "King Koopa Battle". This page was last edited on July 12, 2018, at 21:41.